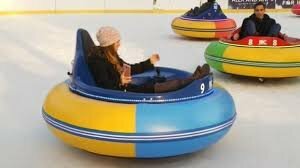 Bumper Cars & Brews - JANUARY DATES ADDED! JANUARY DATES HAVE BEEN ADDED! Grab your friends for a night of fun at the ice rink with ice bumper cars, Indy Beer Taps, Small Town Throwndown Food Truck and a sweet treat to take home! Adults wanna have fun too! This 21 and up event will allow the adults to have the ice bumper cars all to themselves! We are excited to have Indy Beer Taps joining us for the night and providing all the adult beverages! Small Town Throwdown Food Truck will be on-site to feed all your cravings that night! ALL ATTENDEES MUST PRESENT PROOF OF AGE UPON CHECK-IN. PLEASE HAVE IDENTIFICATION READY. These sessions have fewer guests in them so you can ride longer and more often duing your session!